SSL (Secure Sockets Layer) is a security protocol that secures communication over the Internet. Most banking sites and online stores require sensitive information be sent over SSL. This article deals with an "SSL protocol has been disabled" error. For information on other messages received when accessing secure sites, see Error loading secure sites. (Firefox 2) Firefox can't connect securely to www.example.com because the SSL protocol has been disabled. 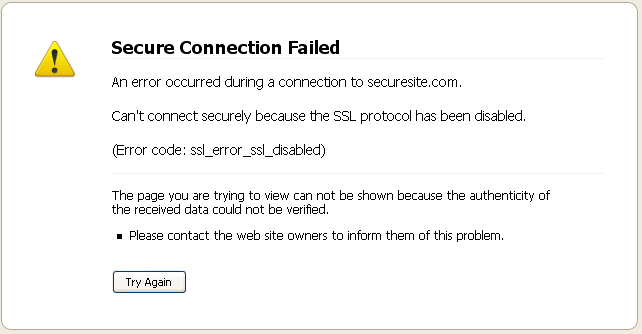 (SeaMonkey 1.x) SeaMonkey can't connect securely to www.example.com because the SSL protocol has been disabled. (Firefox 3 and SeaMonkey 2) Secure Connection Failed. An error occurred during a connection to www.example.com. Note: you can't make a permanent exception in Firefox 3.5 or newer if Firefox is in Private Browsing mode. Check that SSL is enabled. Firefox 2 and above: "Tools -> Options -> Advanced -> Encryption": "Use SSL 3.0" and "Use TLS 1.0" should both be checked. The UI for selecting the required range of encryption protocols has been removed in Firefox 23.0 and later, thus you'll need to change the security.tls.version. * preferences in about:config. SeaMonkey: "Edit -> Preferences -> Privacy & Security -> SSL": At least "TLS 1.1" and "TLS 1.2" should be checked. SSL 3.0 is considered unsafe and disabled by default starting with Firefox/Thunderbird 34.0 and SeaMonkey 2.31. Enable it only to access legacy websites not working with TLS 1.x, and only as long as needed, keeping in mind that it's vulnerable to attacks. TLS 1.0 is an upgrade to SSL 3.0 with a new name (TLS 1.0 = SSL 3.1), TLS 1.1 and 1.2 are further updates to TLS 1.0. In certain circumstances (e.g., government installations), SSL 3.0 has to be kept disabled and user changes disallowed. See Locking preferences how to accomplish that by forcing security.tls.version.min to 1 for the entire installation. If you're using a manual proxy, make sure "Use this proxy for all protocols" and "SSL proxy" in "Tools -> Options -> Advanced -> Network / Connection -> Settings" (Firefox 2 and above) or "Edit -> Preferences -> Advanced -> Proxies" (Mozilla Suite/SeaMonkey) are set to the correct values. Mozilla applications require a loopback connection to be available for SSL. Check your firewall settings to make sure you have not blocked incoming connections to Mozilla applications. See the Firewalls article for details on firewall configuration. If you get an error about an expired certificate that should be valid according to the date or a certificate that will be valid in the future then check the date and time on your computer to make sure that both are correct. You may simply have an out of date version of the page in your cache. Try clearing the cache. You can try this SSL test. If your browser passes, it's likely a problem with the site you're trying to connect to. If you're on Windows 98 or ME and SSL no longer works after updating to Firefox 2.0.0.2 or later, Firefox 1.5.0.10 or later 1.5 builds, and Thunderbird 1.5.0.10 and later 1.5 builds, you may be able to fix it by installing IE 6.0 SP1. If, rather that downloading the program from Mozilla, you compiled the Mozilla application yourself or received it from an administrator, it's possible SSL support was disabled. A corrupt "cert8.db" file in the profile folder can sometimes cause this error. Completely close your Mozilla application and then delete or rename this file (more information here).